Last year I began a fun candy-related tradition before Halloween that involved a quick jaunt to a local Asian market. Instead of my usual trip to the grocery store to procure individual packages of Skittles (which do have their place mind you! 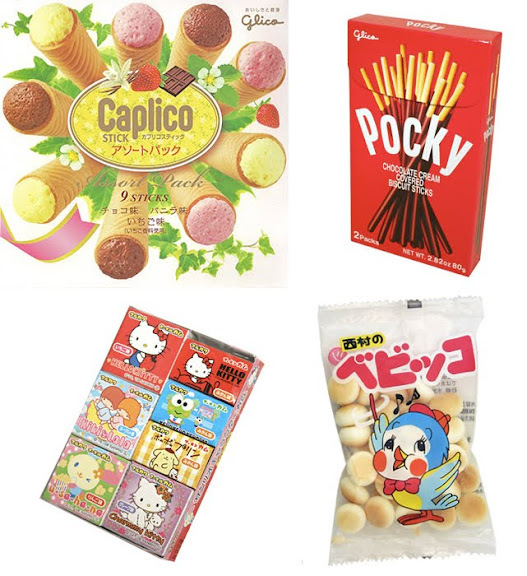 ), I decided it would be fun to help my kids choose some more exotic fare--Japanese candies. The miniature sizes and funky packaging were tough to resist! I found both inexpensive, tiny packages of sweets as well as larger boxes of individually portioned treats that served our purpose well. As predicted their classmates were thrilled with the unique treats and that made my kids feel great--it's always nice to gift someone something they truly love. I'm definitely planning on pressing "repeat" on this one! If you don't have access to an Asian market locally, try this online source instead. Happy Halloween! And speaking of hip treats, when you move to Seattle, be sure to treat yourself to a cupcake from Trophy! I love pocky sticks and japanese bubble gum. I love the sweet and fruity flavors. I'm suddenly wondering where I can find the botan rice paper candy of my childhood! i love this idea...and having had pocky before i can say that it is delicious and much better than most of the hard candy given out. I was so excited to see that our WALMART carries a great assortment of Japanese treats, including Pocky. We love them! Thanks for posting this. I miss these candies. Although, I know you can find 'em in Utah, it's not the same as buying them from a corner store. You can find all of those (except the "ice cream" candies) at any Wal Mart in Hawaii. My favorite is Japanese gum, although, the flavor never lasted more than 3 minutes, the flavors are great. What a fun idea! Have you guys tried Hi-chew's yet? They have great flavors. I grew up eating those snacks. There are tons of other good stuff in Japan. I wish the U.S carried them.